Updating your MacBook or iMac should be free of headaches and drama. 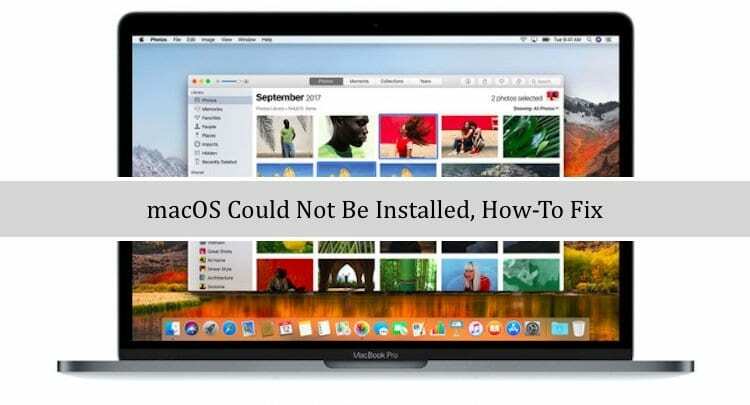 Apple even coined a marketing phrase “it just works!” But recently, a lot of readers and Mac users are finding the opposite–it just doesn’t work! Several users have recently had issues updating their MacBook with the latest version of macOS. Unfortunately, this appears to be a fairly common problem for some when updating to the latest macOS High Sierra update. Then your Mac prompts you to quit the installer and restart your computer. Well, Apple, whatever happened to it just works??? 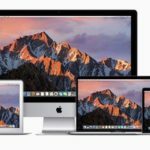 2 Getting macOS could not be installed on your computer? 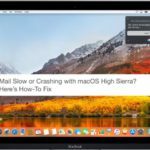 Getting macOS could not be installed on your computer? If you are experiencing this issue with your update, here are a few tips that you can use to address this issue. Before proceeding with the steps below, we suggest that you ensure your Mac’s clock is correct. If your Mac’s Date&Time do not match your current timezone or date, macOS often won’t install. Go to System Preferences > Date & Time. Apple prefers if you choose the option to Set Automatically. Next, let’s try out the basic NVRAM reset (or PRAM for older Macs) on your computer. The other thing is to make sure that your MacBook/Mac has enough space available to complete the update. 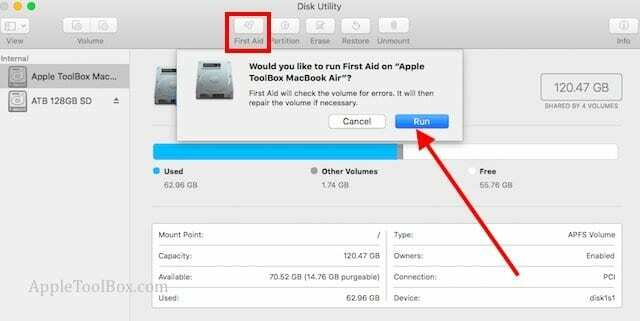 If you are running low on space, Apple provides some guidelines that can help you recover some space on your Mac. Now, that we have taken care of the basics, we suggest that you try each of the processes below until your macOS install problem is fixed. We arranged the how-to-fix steps in three separate categories. The first of the troubleshooting steps walk you through Safe mode options and then we suggest the Recovery mode. The last of the options shows you how to remove third-party KEXT files using simple terminal commands and then try the install process. If you tried the steps above in Safe mode and did not find success, the next course of action is to try the Recovery mode. Sometimes, when you are facing install/upgrade issues, a workaround that works for many users is to create an external bootable installer and try to run the install program using it. Apple provides a detailed white paper on this process. You can create the bootable installer on a USB and then try it to update the macOS. 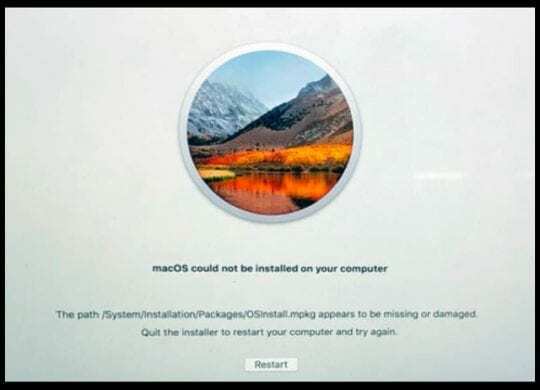 If you are still reading and have already tried the series of fixes in both Safe mode and Recovery mode to no avail, you may have to roll up your sleeves and do a little more digging into the root cause of the issue. Sometimes it’s the third party KEXT extensions that cause a lot of heartache during update/install of macOS. These KEXT Files get added to your Mac/MacBook when you are using third-party devices. If you are not sure about it, your best bet is to look and see what third-party extensions are currently there on your machine. To do so, Open up terminal from your utilities and type in the following to see the non-Apple KEXTs. This command should show you all the third party extensions. Now you can remove them one by one or remove the one that you think may be the suspect. Using terminal, you can unload the kext my using the following command. Here ‘NAMEOFTHEKEXT’ needs to be replaced with the appropriate suspect KEXT file that you found above. Once you have unloaded the KEXT, you can go back and check to make sure that it has indeed been removed by using the kextstat command. Once you have removed all the third party KEXT files and have made sure that you have enough space on your machine for the macOS update, please try and relaunch the install process. If your install process is failing because of a particular problematic file, you can also try to log in using the single user mode and delete that specific file and then try resuming the install. Sometimes you find these problematic ones off files in the Installer log files. 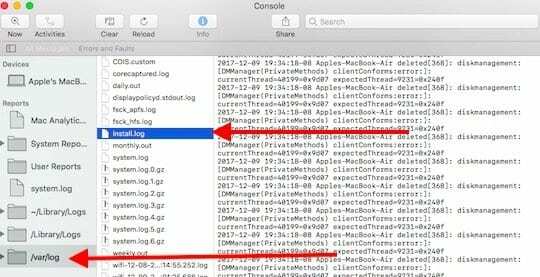 To access these log files, open up the Console app in utilities and click on ‘/var/log’ on the left-hand column and then choose ‘instal.log’ in the next column. We are hoping that you were able to fix the macOS Install issue using some of these tips. If you have tried everything without any success, your best bet is to reach out to Apple Support folks so that they can help out. Please let us know how your install worked by using the comments below. I booted up while holding the Option key and chose my regular MacinstoshHD (not an update volume). Then I booted normally (not with safe mode) and tried again to reinstall the update. Took several reboots but in the end, it worked! This is why I’m a slow adopter, but I got caught anyway because I installed a security update, which we’re always told to do right away. Since then, I’ve been having this problem. A couple times, the computer has shut down on its own when I shut the lid which normally makes it go to sleep. That’s when the problem shows its face again. I’ve been planning to upgrade to Mojave, but since 32 bit apps will not work there at all, I’ve been waiting until I could verify all my apps were 64 bit before proceeding with that. Anyway, from what I’ve read, doing that step does tend to resolve this issue. Worked for me. 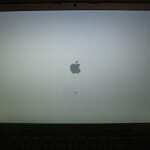 I shut down, turn it on, held command option P R at apple logo screen until installation logs appeared. Selected to restart from a different disk – there was only one disk to select from. My computer is stuck on ‘macOS could not be installed on your computer’ screen. It directs me to quit the installer to restart your computer. There is no evident way to quit the installer as I cannot get into any toolbar or menu. I have tried several things as directed in the appletoolbox. They aren’t working. What else can I do? Lrockhill, Try Shutting down Mac. Keep holding until Apple logo appears. Reinstall macOS. You will lose no data. 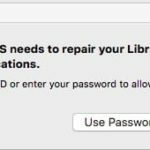 You can verify this by clicking Get Online Help, and scrolling down to “Reinstall macOS”. Or if you have a backup you can restore from, choose Restore From Time Machine Backup. Having said that if you are having issues getting to recovery mode when you start up, I think your best bet would be reach out to Apple Support. Just curious. What macOS are you upgrading from? 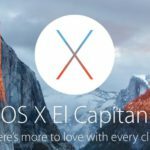 El Capitan or Sierra? Why isn’t it all done by apple automatically?